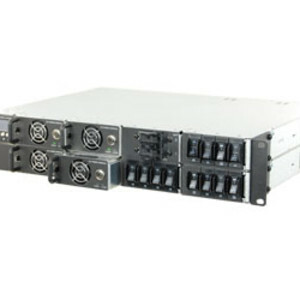 MPS Ultra is a line of 2RU preconfigured, hot-swappable DC power systems for wireless base station applications. Three factory preconfigured models provide 2.8, 3.5 or 5.6 kW of 48 or 24 VDC power. The MPS Ultra combines high efficiency hot swappable power modules and a range of features to meet the requirements of installers and site managers for backhaul, radio access network and other demanding wireless applications. Every model includes the ICT Intelligent Control Module to provide full TCP/IP remote monitoring and control of all system functions. The 2.8 kW and 3.5 kW systems include dual 100 A battery disconnect breakers, a 150 A low-voltage disconnect and configurable, fully managed load outputs rated at 20 A each. The 5.6 KW model is designed to provide bulk power for charging large-scale battery banks. The Intelligent Control Module in the 2.8 and 3.5 kW models provides advanced battery management features, including battery state of charge, estimated run time remaining and battery discharge testing. The MPS Ultra DC power system provides benefits including a load distribution capability that allows connected loads to be power-cycled remotely over Ethernet, either to reboot a device or take it offline for energy savings or scheduled maintenance. The MPS Ultra can be installed without having to remove any covers. All connections are accessible from the rear, making it one of the easiest and fastest DC power systems to install. The Icom IC-F1100D/ IC-F2100D series is an economical standard IDAS digital handheld radio. 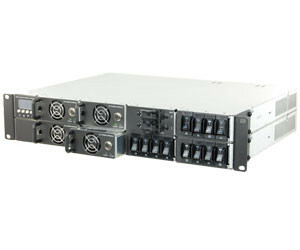 I am interested in MPS Ultra 2RU Hot Swappable DC Power System .